By: Chuck Kaufman, guest scholar at the Council on Hemispheric Affairs. I returned in mid-October from an eleven day delegation to Bolivia, led by Senior COHA Analyst William Camacaro of the Alberto Lovera Bolivarian Circle in New York City. I recognize that no one can parachute into a country they’ve never visited before, especially if one is essentially monolingual like I am, and pretend to have anything authoritative to say. However, I do have some reflections that I want to test out, as well as some observations to report, but please understand that I do not put myself forward as an expert on Bolivia. My first reflection is that President Evo Morales, who won re-election on October 12, with 61% of the vote, while we were still in the country, isn’t just the country’s first indigenous president, he is also essentially the head of what is the first indigenous government – and that is a very big deal for the country indeed. I had no appreciation for that fact before this delegation arrived. Madeline Albright was the first woman Secretary of State in the U.S., but her gender had no significance in the exercise of U.S. foreign policy. This is not so in the case of Morales, a member of the Aymara people of the highlands who the Incan Empire was never able to conquer. Forty percent of his cabinet members are indigenous Aymara or Quechua people, and 50 percent are women, a fact I would posit is related equally to a modern understanding of gender equality and to the indigenous traditional Ayllu system of community governance in which the co-leaders were husband and wife. Just one example of what they call in Bolivia “the process of change” is that the traditional indigenous justice system is enshrined in the 2009 constitution. This law enables most crimes and conflicts in the indigenous communities to be resolved under the traditional indigenous system of justice. Some serious crimes like murder and domestic violence are referred to the national court system, but most disputes among community members are legally resolved by traditional processes which emphasize reconciliation and rapid response time. Judges are elected by the community and serve for one year without compensation. The entire community gathers to observe the legal process and to support and enforce the outcome. I haven’t checked, but I’ll bet there are a lot fewer lawyers per capita in Bolivia than there are to be found in the United States. Among the many meetings that the delegation had, the meetings with women leaders in government and the popular movements were the most instructive to me. The women, dressed in traditional clothing, including the 19th century bowler hats we probably all learned about from National Geographic, were uniformly strong and eloquent leaders. One woman told us her story of beginning to organize at age 15. She became head of a women’s group and received an invitation to a conference in Denmark. She went to a lawyer for help in getting identification documents as well as a passport. He told her, “What do you need a passport for? You’re a peasant and peasants don’t go anywhere.” He also said of her traditional dress, “You’re not going to go dressed like that are you? You’ll be an embarrassment to our country.” What did she do? She went to law school and became a lawyer so that other indigenous women would not have to go through the humiliation she was forced to suffer. She told us that she discovered too late in her own pregnancy that there were programs of health and nutrition for expectant and lactating mothers. Today she has made it her life mission, with President Morales’ official blessing, to inform urban and rural women about their rights and about the programs available to them. This is not to say that Bolivia is a paradise for women. We also heard the stories we have heard in other countries about how women are held back by the culture of machismo. We met with several leaders of the Bartolina Sisa Women’s Federation. They said that their meetings with only women were met with distrust and hostility by their husbands, so they took to inviting their husbands to attend them as well. One of our delegates asked how they kept the men from taking over their meetings. He was told, “As long as you are kind and gentle, men are very easy to manipulate.” Strong women indeed! Another point I would like to put forward to test for validity is that in a country with a relatively huge proportion of indigenous inhabitants, the interests of some of the indigenous will inevitably conflict with the interests of other segments of indigenous populations. I believe that here in the U.S., liberals and progressives tend to romanticize indigeneity to the point that it becomes a form of racism. Indigenous people are seen as one dimensional with monolithic interests that are always more pure than those of us who aren’t indigenous. The TIPNIS highway that would connect Brazil and Bolivia as a commercial thoroughfare is a prime example of conflicting indigenous interests. The highway tends to be supported by those indigenous who deal in goods and crops they want to get to market and is opposed by indigenous people who want to preserve their land as is. This conflict of interests is precisely why the U.S. government, through the U.S. Agency for International Development (USAID), is investing heavily in indigenous groups that oppose the highway, even though this would work to restrict free trade. This is being done to exacerbate existing differences in a way that will weaken the Morales government. Everywhere else the U.S. promotes the expansion of trade. But in Bolivia, where the Morales government has expelled the U.S. Drug Enforcement Administration (DEA) and USAID, the U.S. will abandon one of its fundamental principles – free trade – in an effort to weaken the Bolivian government. Without a doubt, U.S. funding damages the credibility of indigenous groups that take it. But equally without doubt, there are conflicting economic and cultural interests among the indigenous themselves, and that is something groups and individuals on either side of the debate in the U.S. seem unable to deal with. Related to the issue of the inability of solidarity activists to deal with complexity, we heard from at least one source that there is already a road along the route where the TIPNIS highway is being built. The problem is that it is just not a very good road. According to this source, the new highway is simply an improvement of the old road, not the wholesale decimation of pristine wilderness. At this point it is difficult to judge the validity of either position which is why I’m glad that the organization I am part of, Alliance for Global Justice, sees its role as opposing U.S. intervention, in this case USAID’s position which is destabilizing. We have faith in the ability of Bolivians to sort out their own affairs. There’s certainly no track record to indicate that the United States, whether our government or non-governmental organizations (NGOs), is better at making these decisions than the people whose lives are directly affected. At the beginning of our delegation we met with a number of groups in Cochabamba. That city is well known in the anti-corporate globalization movement as the city that defeated Bechtel Corporation’s effort to gain commercial control of its water supply. For Bechtel, the largest construction and engineering company and the fourth largest privately held corporation in the United States, Cochabamba was the test case for its objective to monopolize control of the world’s water supply. In 2000 and 2002, Cochabambans militantly resisted Bechtel’s efforts, which were supported by the then Bolivian government of strongman Hugo Banzer. At great loss of life and injury, the people ejected Bechtel from their city. Interestingly, the Wikipedia entry on Bechtel currently says nothing about water when it talks about its oil, gas, and other international holdings. The people of Cochabamba take great pride in their revolutionary success and view it as paving the way for Evo Morales’ 2005 presidential victory. I was most impressed by the Red TINKU (Meeting and Exchange Network in Quechua), which maintains a permanent presence in the city plaza, which was ground zero for what is known as the “water wars.” For me it was an incredible experience to observe an evening educational forum they held on the square; something they do every evening. With butcher paper and magic markers one of the group’s leaders discussed the thesis, “The process of change in the context of the elections.” The presenter led 50 or so attentive residents through the antecedents of the election including the water wars, the gas war, the 1952 revolution, etc. demonstrating that elections don’t just happen, but are the result of historical struggle and pointing out that Cochabambans have played an outsized role in that struggle. This is how mass movements are built through the popular, political, and revolutionary education of ordinary people. Perhaps there are places in the U.S. where this kind of grassroots education process is taking place, but I’m not aware of them. The Occupy Movement made a start at it, before the U.S. government coordinated its violent disruption. If we are going to achieve transformational change in the U.S., this is one of the tools activists need to add to the toolbox. One can’t write about Bolivia without discussing coca, the bush from whose leaves cocaine is manufactured. Evo Morales rose to political prominence as head of the coca growers union and coca is an ancient crop, tightly bound to indigenous culture for its medicinal qualities to help one cope with the high altitude, hunger, and a raft of other health issues. I can attest personally to its medicinal qualities. I never was able to adjust to the altitudes of 4,000+ meters (12,500+ feet). In La Paz, the Venezuelan embassy generously provided an oxygen tank for me after the hotel wanted to charge $400 USD for one. When we were out and about, I drank gallons of coca tea and often chewed coca leaves, without which I would have been immobilized. The tea and leaves didn’t make me “high.” Their use did not have any noticeable impact other than to allow me to function at that altitude. The United States labels Bolivia as “uncooperative” with its militarized Drug War that has spread death and misery through the “cooperative” countries of Latin America. Bolivia has instead charted an effective and rational campaign to cut the illegal drug supply chain. We visited Chapare, an area of Cochabama province consisting of mostly upland valley rainforest around the Chapare River, an Amazon tributary. It is an ideal climate for growing coca and was the center of violent conflicts until the Morales government kicked out the U.S. DEA and implemented a crop substitution and economic diversification plan, enforced by the coca growers themselves. According to presentations we received, this policy produces just enough coca for domestic use and has all but eliminated the illegal market causing the drug cartels to move elsewhere. Each coca grower within the union is permitted to plant coca on plots totaling 40 x 80 meters. If a union member tries to grow more, their entire crop is seized by the union. Leaves are harvested every few months and sold in government approved and monitored markets. This system only works if farmers can earn enough to survive by substituting other crops on the land where they used to grow coca. After all, they grew coca in the first place because they couldn’t feed their families on income from subsistence farming. We visited four small, government-owned factories that have been built to create markets for the substitute crops. One factory produced coca products such as candy, tea, and liquor for a commercial enterprise; the other three produce heart of palm, orange juice, and yogurt. The government owns the factories that we were told employ between 30 and 100 people each, while other units of government, in the case of the non-coca products, buy them for school lunches and lactating women’s programs. Frankly, given the lack of observable activity at all but the yogurt plant, the program seems to be more aspirational than functional. Still, even as a work in progress it is obviously superior and cheaper in lives and money than the militarized U.S. Drug War. Bolivia’s example should be held up as a model for other countries rather than negatively sanctioned by U.S. officials. But, there are too many U.S. economic interests that benefit from the status quo on the militarized war on drugs that block a rational drug policy. These include the military-industrial complex, operators of for-profit private prisons, and the banking sector which makes huge profits laundering the drug money. 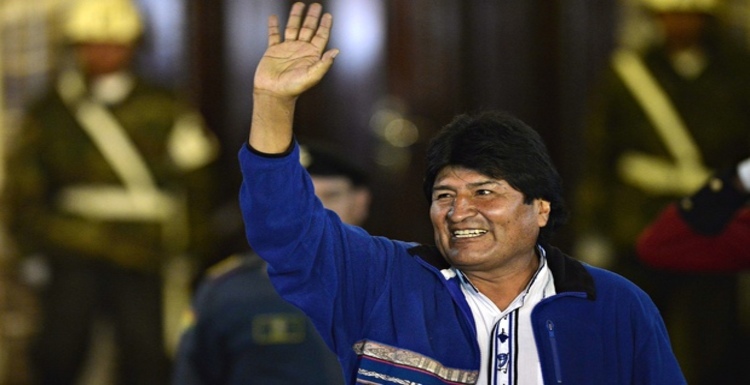 The process of change in Bolivia will be expedited by Evo Morales’ landslide electoral mandate on Oct. 12, 2014, which will now carry his government through 2020. The change will be too slow for some, while too fast for others. His tendency to make compromises with corporate and political actors in an effort to chart a peaceful path toward socialism will generate criticism and debate within and without Bolivia. He will make mistakes and he will also put forth grand visions that will inspire and mobilize some Bolivians and those international activists who seek to build a better world through their actions in their own countries. Whatever its failings, whatever its successes, there is no doubt that this is a progressive government that deserves our solidarity and vigilant efforts to thwart the U.S. from killing hope as it has done in all too often in similar situations in the past, and which it continues to do around the world. Latin America today is the region of the world that has most successfully thrown off U.S. hegemony at the start of the new millennium. The election is an important success that those seeking to construct a new constructive agenda should be morally required to help defend. One speaker told us “we make the road by walking it.” That seems to me to be a universal truth.